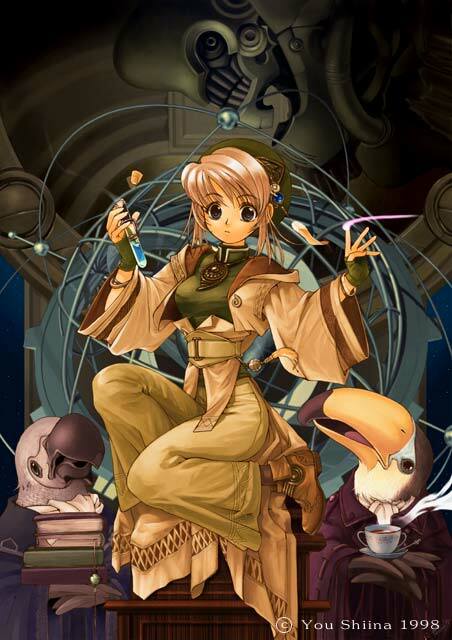 Anneys is an alchemist and a witch, with skills in chemistry, pharmaceuticals and magic. Unlike most of her contemporaries, Anneys is not concerned with using alchemy for greed, but more for the pursuit of knowledge and to aid others. She uses a mix of magic and science to make her creations, as well as a good deal of experimentation. All of Anneys's spells use some type of potion, herb, balm, etc as a catalyst - all of her spells thus far require a reagent. Many of her spells are for mundane uses, like ones to repel insects or conjure foxfire. She has a very few combat spells, mostly along the lines of something like a fireball cast by magically alighting a small bundle of fire-sympathetic herb, such as witchhazel or juniper. Anneys's magic is not the flashy, fantastical kind, but a strong, powerful intertwining of science, magic, and belief in her faith. She will often speak to the herbs and minerals she uses in her spells, bringing out their natural sympathies to help her endeavors. Anneys has her own large garden and laboratory, currently in storage. It will be moved bit by bit onto the Blaze of Glory, by her servants. Anneys is is attended to by three of an avian race rare to her home planet. She helped save their enclave from a serious illness when she was fairly young, and these servants have been with her ever since. Their names are not pronounceable to the human tongue, so they are dubbed 'Domo Jeeves,' Domo Alfred,' and 'Domo Frederick.' Alfred is the Major-Domo. Anneys lives by the Witches' Reade, 'Do as ye will, an harm none.' She is a stalwart pacifist and will refuse to make any substance which will harm another like explosives or poisons. She will only use her magic defensively and most generally for helpful or healing purposes. She is also physically weak and doesn't have a very hearty immune system, leading her to get ill rather easily and more often than the average person; the result from a bad illness when she was very young. She also has a terrible sense of direction. Anneys's coven was nearly wiped out by a deadly decease when she was a very young child. She was one of the few survivors, only surviving thanks to the intervention of the Alchemists' Guild and a few notable physikers responding to charity work. Her family and guardians all dead, Anneys became a ward of the Alchemists' Guild, and spent many months ill in bed. While bed-bound, she proved herself to be very bright and began training in alchemy. Once recovered,Anneys swore to herself and her deities that she would do everything in her power to guarantee no other child would ever have to lose their family to illness and decease again. She moved quickly through the harsh Academy of Alchemy and earned her station within the Guild at a record pace. Once she graduated, Anneys returned to living with a witches' coven, training with the sagest of yarb witches, wart-charmers , and medicine women, learning how to blend science, magic and faith into a fine tapestry of power. She did not train with wizards,sorcerers or mages, as Anneys's magic springs from her natural surroundings and faith, instead of arcane arts or other planes. Despite her age, Anneys became a very notable alchemist in her world. She was quite peaceful in her small village, visited often by rich merchants, messengers from royal courts around the world and pilgrims from every almost every race. Her world eventually was contacted by the Coalition of Realities, due to it's peaceful (though technologically disinclined) state. She was offered the chance to see new dimensions by working for the CoRe as it negotiated with her planet's leaders, and she could hardly refuse the offer.